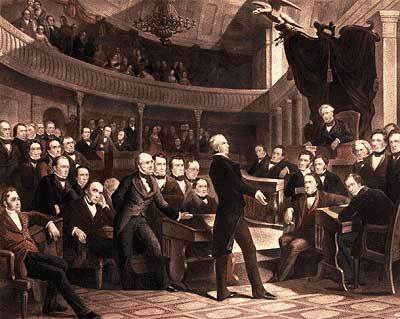 The "Great Compromiser," Henry Clay, introduces the Compromise of 1850 in the Senate. The plan was set forth. The giants — Calhoun, Webster, and Clay — had spoken. Still the Congress debated the contentious issues well into the summer. Each time Clay's Compromise was set forth for a vote, it did not receive a majority. Henry Clay himself had to leave in sickness, before the dispute could be resolved. In his place, Stephen Douglas worked tirelessly to end the fight. On July 9, President Zachary Taylor died of food poisoning. His successor, Millard Fillmore, was much more interested in compromise. The environment for a deal was set. By September, Clay's Compromise became law. California was admitted to the Union as the 16th free state. 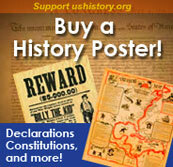 In exchange, the south was guaranteed that no federal restrictions on slavery would be placed on Utah or New Mexico. Texas lost its boundary claims in New Mexico, but the Congress compensated Texas with $10 million. Slavery was maintained in the nation's capital, but the slave trade was prohibited. Finally, and most controversially, a Fugitive Slave Law was passed, requiring northerners to return runaway slaves to their owners under penalty of law. The Compromise of 1850 overturned the Missouri Compromise and left the overall issue of slavery unsettled. Slave trade prohibited in Washington D.C. Slaveholding permitted in Washington D.C.
Who gained the most from the Compromise of 1850? Who won and who lost in the deal? Although each side received benefits, the north seemed to gain the most. The balance of the Senate was now with the free states, although California often voted with the south on many issues in the 1850s. The major victory for the south was the Fugitive Slave Law. In the end, the north refused to enforce it. Massachusetts even called for its nullification, stealing an argument from John C. Calhoun. Northerners claimed the law was unfair. The flagrant violation of the Fugitive Slave Law set the scene for the tempest that emerged later in the decade. But for now, Americans hoped against hope that the fragile peace would prevail. This is much less a biography than a collection of raw facts and dates in the life of Henry Clay, but there are so many of them this is a great resource. And coming from the U.S. Congress, we can be sure the information is correct. This is the speech that likely cost Daniel Webster any chance of becoming President. In it he supported, on Constitutional grounds, the Fugitive Slave Law of 1850. What did the common voter think of politics and national affairs in 1852? Pertinent entries from the diary of the Rev. Alpheus S. Bigelow have been transcribed by a descendant and posted on the Bigelow Society genealogy website. Anthony Burns was captured and returned under the Fugitive Slave Act in 1854, but not before the courthouse door was beaten down with a battering ram, a deputy was stabbed, and President Pierce ordered Marines and artillery to guard the prisoner. The division of the nation wasn't the only issue at stake in 1850. Four different plans were proposed to divide the state of Texas.